There is no doubt that there are fewer paintings than sculptures in this museum, and they represent fewer historical periods. Nevertheless, among the paintings acquired by Marès several are of the highest quality and importance. 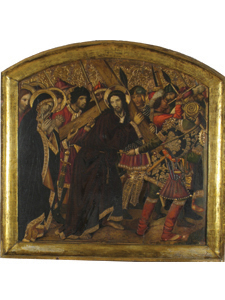 This panel painting was part of the main altarpiece in the church of the Convent of Sant Agustí Vell in Barcelona. The pictorial cycle was commissioned in 1463 by the Tanners Guild, who entrusted the work to Jaume Huguet, one of the most representative Catalan painters during the Gothic era. The Saint Augustine altarpiece, dedicated to the patron saint of tanners, is considered to have been the most important pictorial commission in Catalonia in the second half of the 15th century. The piece before us would have formed part of the predella of the altarpiece. Simon of Cyrene helps Jesus as he carries the cross, in the presence of Mary and Saint John. On the right we see the executioners who stand out in their fine vestments. Jesus and his mother exchange a look that expresses a profound but contained grief-an emotion that is also reflected by the imploring and intertwined hands of Saint John. Critics hold that this panel was painted almost entirely by Huguet himself and that his workshop's participation was extremely limited. Stylistically, this is a magnificently mature work of art. As a result of the bombing suffered by Barcelona in 1714 at the hands of Felipe V's troops, the church of Sant Agustí was partially destroyed, its altarpiece taken apart and dispersed. Today, the only pieces that survive are this one, another from the predella that shows the Last Supper, and six panel paintings from the central section. All of these can be found in the Museu Nacional d'Art de Catalunya.